Crepes are one of my favorite things to make for my family. They cook in just a few minutes and are incredibly versatile. You can make savory cheese & ham crepes or have a decadent dessert crepe for breakfast, lunch or dinner. The combinations and possibilities are endless. If you are looking for a light and fluffy crepe that only has a handful of ingredients, then this recipe is for you! I made these this morning for my family, and they were so good! I made a few variations, because they wanted different toppings and stuffing in their crepes. 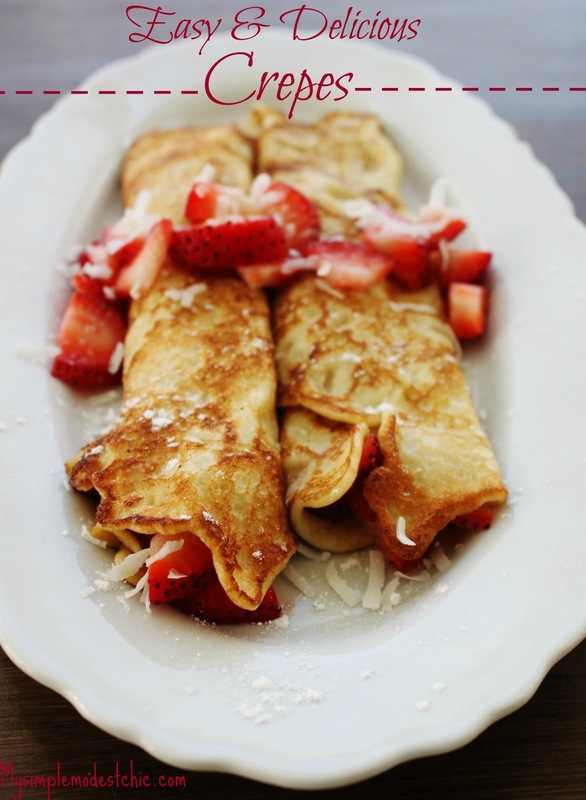 These crepes were mine because I adore coconut and strawberries. In a blender, combine flour, eggs, milk, water, butter, sugar and salt. Heat and grease pan to medium heat. Pour about ¼ cup of batter into pan, then tilt the pan in a circular motion to allow the batter to spread evenly. Cook crepe for about 1 to 2 minutes until the bottom is light brown. Turn Crepe over with a spatula, and cook the other side for about 1 minute. Serve warm and add your favorite toppings.